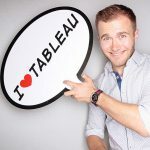 tableaufans.com » How to save Excel files while Tableau is open? How to save Excel files while Tableau is open? Not being able to change Excel files (e.g. in planning scenarios) while you’re analyzing the very same file within Tableau. Links from within the video?